Our practice is dedicated to the prevention, diagnosis and treatment of orthopedic injuries. We specialize in minimally invasive arthroscopic surgery of the hip, shoulder and hamstrings. The Guanche procedure is the latest technique in the endoscopic management of hamstring injuries. We also manage shoulder and rotator cuff problems, traditional shoulder replacements and reverse replacements. 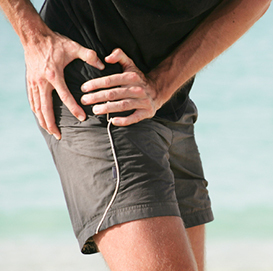 In addition, we perform anterior total hip replacements, often as an outpatient procedure. Finally, we perform many PRP (platelet rich plasma) and stem cell procedures in an attempt to avoid surgery. Our mission is to provide the latest and most current treatment to our patients, most of who can be managed non-surgically. When surgery is indicated, we specialize in the most advanced, cutting-edge, minimally invasive procedures to help our patients get back to their desired level of activity as quickly as possible. Carlos Guanche, M.D. is a world-renown expert in hip and shoulder arthroscopy as well as complex shoulder reconstruction. In the 20 years he has been in practice he has treated thousands of patients, many whose professional lives depend on his skilled hands to bring them back from debilitating injury to center stage – and court. Faced with career-threatening conditions, professional athletes and world famous entertainers have entrusted their well being to Dr. Guanche. Dr. Guanche demonstrates several common examination techniques to help sort out whether you may have a hip labral tear or not. Dr. Guanche gives a presentation at the Cherry Blossom Orthopedic Seminar in Washington, DC on April, 2011. The talk describes the typical management of snapping hip due to either psoas snapping or in some cases, iliotibial band snapping. Dr. Guanche gives a presentation at the Cherry Blossom Orthopedic Seminar in Washington, DC in April, 2011. The talk describes the typical management of athletic hip injuries, including labral repair as well as impingement surgery.